A mix of clouds and sun. High 84F. 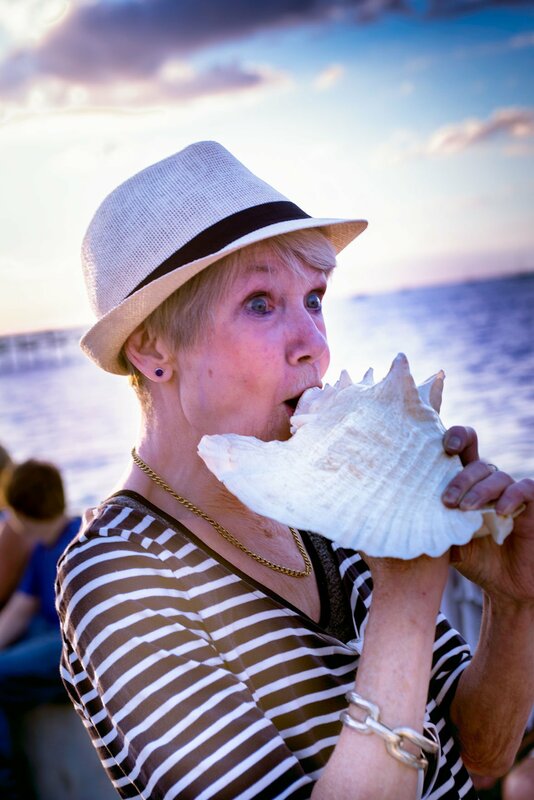 Winds SW at 10 to 15 mph..
Left: Nancy Quillen practices with her conch shell horn, at the annual New Year’s Eve Sunset Conch Horn Blow at Gilchrist Park in Punta Gorda. Maureen Sullivan, of Montreal, Canada, makes some noise at the Annual New Year’s Eve Sunset Conch Horn Blow. From left: Jerry York, Leanne Maples and Tom Wilson. Carl Pate, 13, of Trenton, Michigan, performs on his Conch horn. Carl, a trombone player, is marking his seventh New Year’s Eve at the Conch Blow. Patty Eaton practices with her Conch shell horn. Gilchrist Park in Punta Gorda was filled with people "blowing the last sundown" of 2018. According to tradition, by saying farewell to the old year by blowing the sun down, good luck, peace and prosperity will come to the area. The noisemakers began at 5:44 p.m. and continued until the last rays disappeared into the harbor.